April 24, 2015 (San Diego) – With Arbor Day upon us, San Diego Gas & Electric's (SDG&E) Vegetation Management team is reminding customers and landscapers to plant the “Right Tree in the Right Place” this Arbor Day. October 11, 2012 (El Cajon) – If Cuyamaca College grant writers were members of a college sports team, they would be basking in the glory of a triple-season winning streak. You’ve heard of the Dream Team? Meet Cuyamaca’s Green Team. 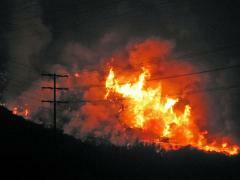 November 1, 2009 (San Diego) – San Diego Gas & Electric Company (SDG&E) has agreed to pay $14.3 million to the state to settle claims that its poor maintenance caused the 2007 Witch Creek, Rice, and Guejito fires, plus an extra $400,000 in reimbursement to the Public Utilities Commission (PUC). SDG&E did not admit causing the fires, but did issue an apology for obstructing investigators seeking causes of the fires. Cox Cable agreed to pay the state $2 million. “We believe that our line was properly maintained and intact prior to the Santa Ana winds in 2007, and did not cause the Guejito fire,” a Cox statement read. The PUC will decide after a public hearing in San Diego whether to approve the proposed settlement, which would be paid from company profits, not ratepayers.